There is missing money from the accounts of the building fund for the University. A Professor Ballard is suspect of the thefts but there is one problem, he’s dead, burned up in a car accident. His death would naturally close down the questions about the misappropriated funds but its doesn’t. The Professors grieving widow is the object of Gene’s attentions and rightfully so. Recently a known sketchy antiquities dealer has been hanging around the Professor so Gene follows this trail to a number of surprises that go back many years. Skeleton in the Cupboard is actually an interesting episode that clearly stands out amongst a large number of other episodes of this series. The elements are all right, a fake death (with exploding car), a grieving widow, skeletons, anthropology, a dodgy dealer and a host of good actors. Basil Dignam, a personal favourite, plays the Professor that slowly goes mad thinking about his experiments in human migration. Roy Kinnear, Johnnie Wade and Lance Percival are certainly some great names to me and have done this episode proud. 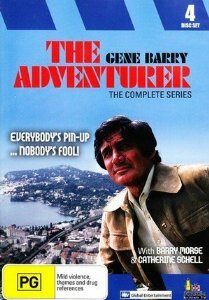 As I have mentioned before, Gene Barry has become a lethargic actor but in this case the story benefits from this subdued character. Fun to watch and I recommend. Harry calls in the help of the Contessa from far away because of a possible kidnapping of the President. Harry and the team fake the kidnapping to bring out the real extremist into the forefront. But the kidnappers are smart enough to not fall for such a trick. However there may be an even bigger trick that has been played out, with the presidents life at stake. An episode of a power grab after the death of the leader. This must happen quite a lot but in this case its the presidents wife, a nice twist. The exotic location was enough to keep me interested but the story was relatively simple. All in all this episode was not one of the strongest.